New Maruti Alto 800 vs Current Alto 800- What To Expect? New Maruti Alto 800 vs Current Alto 800- Changes you can expect! 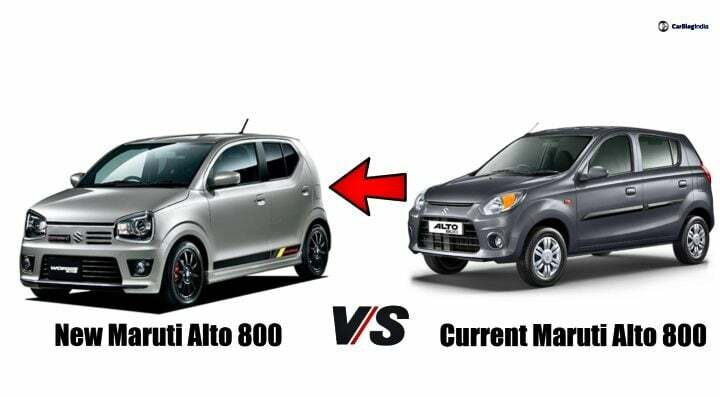 In this detailed specification based comparison, we pitch the new Maruti Alto 800 vs current Alto 800 against each other in order to see what can we expect from the new iteration of this entry-level hatchback. Since its launch, the Alto has been a very important product for Maruti Suzuki in India. Up until recently, this entry-level hatchback with its practical credentials has been topping the sales charts, month on month, and hence emerging as the best-seller in our country. As new emission and crash test norms come in to effect starting next year, Maruti Suzuki has already commenced working on a major update for this entry-level hatchback. If recent media reports are to be believed then the automaker is planning to launch a mild update for the Alto sometime during the first half of 2019. Subsequently, this will be followed by a complete generation overhaul in the year 2020. In this detailed article, we bring you a specification based comparison report between the current iteration of the Alto 800 and the new one set to launch soon. This will give you a detailed idea of what all new features, specifications and updates you can expect from the new iteration of this entry-level hatchback. India is currently obsessed with SUV inspired design and the persona such aesthetics offer. Renault’s strategy to incorporate beefy looks in the entry-level hatchback KWID has worked wonders for the company. Maruti Suzuki is expected to adopt a similar exterior design (SUV inspired) for the next-generation Alto 800. In comparison to the humble aesthetics of the current generation car, the new one is bound to get a more muscular design and various highlights to support it. The new iteration of this entry-level hatchback can take its inspiration from the Future Concept S showcased at the 2018 Auto Expo. That said, the aforementioned concept is confirmed to give birth to a micro-SUV, which will sit below the Vitara Brezza. The current generation of the Maruti Suzuki Alto 800, just like its exterior design, comes with a simple and neat cabin layout and design. But as we have seen in recent times, customers, even in the entry-level segment, are not ready to compromise on basic functional features. Once again, considering the example of the Renault KWID. Keeping this in mind, the new iteration of the Maruti Alto is going to come with a stylish cabin layout. Maruti can do swanky interiors, as we have seen with first the Ignis and then the Swift. Expect the Alto to get a similar treatment as well. It would be too early to make any specific assumptions about the cabin layout. In addition to revamping the interior design layout, we expect the next-generation Alto 800 to be a step-ahead in-terms of onboard features and creature comforts. The current iteration does not offer a very expansive feature list and looses out to the competition in this regard. With the 202 generation update, expect this car to come with a touchscreen infotainment system, reverse parking camera, electrically operated ORVMs among some other basic functional features. Not only this, as mentioned before, the 2020 model will have the right amount of safety kit as standard across the hatchback’s variant range. It will offer dual-front airbags, Anti-lock braking system, Electronic brake force distribution, rear parking sensors and ISOFIX child seat mounts. None of these features is available on the current spec version, not even as an optional extra. It would be too early to comment on the engine specifications of the next-generation Maruti Suzuki Alto. However, what we can confirm is that whatever the engine Maruti decided to use in the new Alto, it will meet the BS-VI emission regulations for sure. Several media reports state that the company can use a smaller, 600cc, 3-cylinder petrol engine, which currently propels the Japanese spec, Alto. This engine promises a fuel-efficiency figure of more than 30 km/l. That said, this engine might turn out to be slightly underpowered for our market. The other options would be a re-engineer the current spec 800cc and 999cc engine for upcoming emissions norms. But these would involve quite a lot of investment which can lead to a considerable increase in the prices of the end product. With new features, a stronger body shell, and probably new engines with high emission ratings, the prices of the next-generation Maruti Suzuki Alto 800 are like to go up. But as we have seen, people are ready to pay a slight premium if they get a better package altogether. Also Read: Maruti Ciaz 2018 Vs Old Ciaz -What’s The Difference? And with prices increase across the market, because of similar reasons, in the end, it will not seem like a bad deal after all. We expect the next-generation Maruti Alto prices to range in-between INR 3 lakhs to 5 lakhs. For reference, the current generation iteration of this hatchback retails from INR 2.5 lakhs to 4.2 lakhs.